Hi, my name is Angel and I’ve been racing triathlons for the past 5 years. I’m a runner turned triathlete after I broke my leg in a night ultra race and took up cycling and swimming during my recovery when I could not run. After my first triathlon I was hooked!! I’ve raced every distance from super sprint to 140.6 and 70.3 is my favorite distance by far! 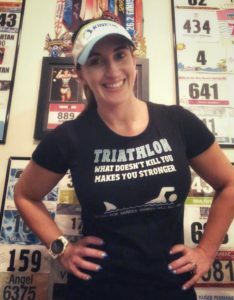 My passion has been getting more women into triathlons, specifically mothers as I know how hard it was when my kids were little to workout and find something that they enjoyed outside of being a wife and a mom. I’ve helped host super sprint training and a race for our local women’s running chapter. I’m so excited to be an ambassador for Kinetic Multisports and hope to get more military wives in the local area to Try a Tri! Look for me at your next Kinetic Multisports race and introduce yourself.